Evolutions and advancements in the technology are continuously changing the face of cosmetic surgery and the way people were getting them. The turn of the 21st century, we all saw a boom in cosmetic surgery and its leading trend for extreme aesthetic enhancements. From the last 15 years, there has been a great transformation in the cosmetic surgery industry which has brought a dramatic change in the concept of what is ‘beautiful’. The cosmetic industry is eternally dreaming up new ways to duplicate the effects of surgical procedures, with and without actually using the surgical procedures. Once, the very notion of plastic surgery and cosmetic surgery was a taboo- but these days it’s all changing and are considered as a common practice to tweak. Ironically, the rise of non-surgical treatments has made discussing and even flaunting a little nip and tuck more usual than ever before, because getting a beautiful touch-up is itself becoming more popular for both men and women and how easy-to-hide procedures they are to be get done in a lunch break. A few years ago, celebrities or even common people tried to hide that they ‘got it done’, but today they are openly talking about their anti-wrinkle injection treatments and their results, recording themselves getting dermal fillers treatments on Snapchat, Instagram and other social media platforms. Do these non-surgical procedures mean we are at the leading edge of a cosmetic surgery revolution? 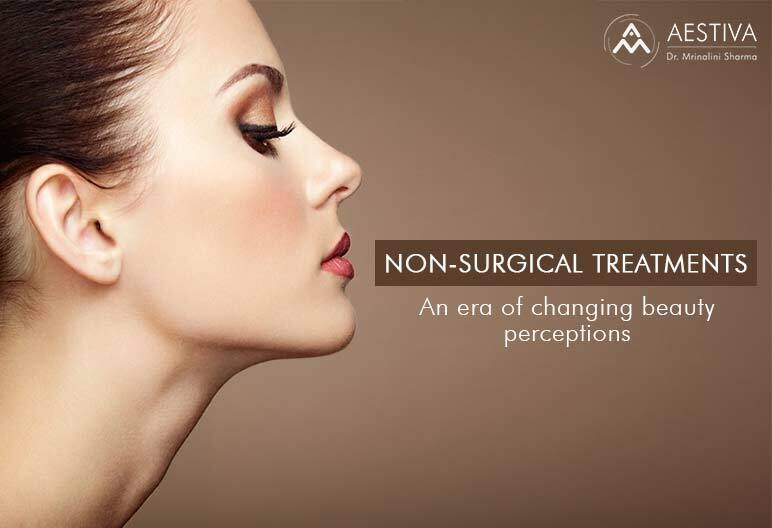 Non-surgical treatments are the ideal solutions for those who want to make subtle changes to their facial features for a flawless finish to their face giving a younger and naturally rejuvenated appearance till there is a definite requirement of a surgical procedure. The techniques that are being used for non-surgical treatments have significant aesthetic benefits and enhances the natural beauty in return. Not only these procedures provide a natural look without using a knife but they are safe, effective, and have less chances of complications following the procedure, minimal downtime, and no side-effects post-procedure. Choose non-surgical procedures when you don’t want to get a permanent change as the results that what your surgery results could bring. For example if you are unhappy with the natural shape of your nose, you might consider Rhinoplasty as your ideal option and can’t ever be replaced. But, before you undergo this surgical procedure to get the permanent change in the natural shape of your nose, there are so many other ways available to you that can alter imperfections like injectables. Injectables helps to sculpt the shape of the face that usually takes less time as compared to a surgical procedure which of course if permanent and most recommeded, however the results can be reversed if you are not satisfied with the given results in a non surgical procedure. Go for a non-surgical treatment when you feel nervous about getting a surgery and if you want minimal downtime and don’t mind a series of treatments. A Non-surgical treatment improves your overall appearance and gives you natural looking results in return with minimal discomfort following the procedure. You don’t need to go under the knife to get the desired changes in your natural facial appearance. These procedures like chemical peels, dermal fillers, anti-wrinkle injections, etc. are great options for those who want less downtime and aren’t bothered with the fact that a series of treatment sessions are necessary to get the desired results. Do you need a little bit of immediate definition? Go for fillers. Injectable fillers can improve the overall look of the face by adding contours to your facial feature. They can immediately define your facial features and can instantly add volume and lift your face. Sagging and laxity can be corrected significantly. Non-surgical treatments are the ideal solutions for those who want to have dramatic changes and desire for natural-looking results. Nowadays, few people don’t want extreme changes and dramatic results but the desire for natural appearing results rather than pushing things beyond the limit. So non-surgical treatments like injectables are the solutions for their desire to get fulfilled until they are ready to inherit permanent beauty through a surgical procedure. The dream of growing older gracefully is a dream of many. Looking happy, refreshed, youthful is just not a matter of vanity but looking decades younger, more refreshed not sleepy, happy not angry, which is something that even like me can appreciate. These treatments won’t change your life not even your personal problems or make you look like your favourite celebrity. But it may improve your overall appearance, give you greater self-confidence and add to your sense of well-being. And natural-looking appearance without facing the fear of knife. To know more do visit us on Aestiva Clinic.